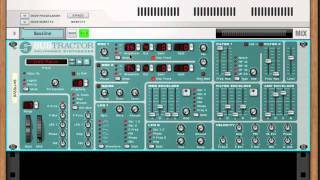 Subtractor is an analog type polyphonic synthesizer based on subtractive synthesis, the method used in classic, analog synthesizers. Similar in layout of the analog flagships of the early 80s, the Subtractor is an easy way to create anything from warm pads to rumbling bass. Its two oscillators can produce well known basic waveforms like square, sawtooth, triangle and sine plus additional waveforms based on samples. The layout is simple to grasp with all the controls conveniently visible on the panel, but there is still no lack of possibilities. 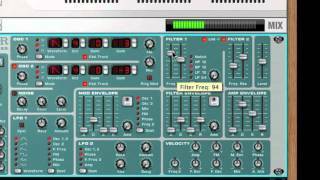 With dual filters, three envelope generators and two LFOs, the Subtractor can produce just about any sound you want it to. All the Subtractor's parameters are fully automatable, meaning that it's easy to record and edit any parameter changes on the Subtractor. 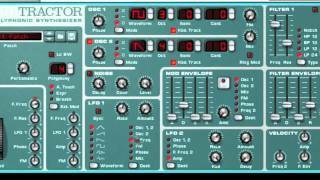 A unique feature of the Subtractor Synthesizer is the oscillator phase offset. By using this feature you can create complex waveforms by subtracting or multiplying a waveform with a phase offset copy of it self. Did that sound like gibberish? Well, let's take a look at how it works. Each oscillator has its own phase offset setting and selector for waveform subtraction, multiplication or no phase offset modulation. When activated, the oscillator creates a second waveform of the same shape and offsets it to the amount set with the Phase knob and then subtracts or multiplies the two waveforms with each other.